Sinn Féin housing spokesperson Eoin Ó Broin. A MOTION OF no confidence against Housing Minister Eoghan Murphy has been dropped today by Sinn Féin. The threat of a motion of no confidence was raised after Murphy was criticised over his handling of the homelessness crisis and the government’s efforts to tackle the housing shortage. But it was announced at the Sinn Féin Ard Fheis, which is being held in Belfast this weekend, that the party wouldn’t present a motion of no confidence in Murphy. Aengus Ó Snodaigh said the party would use its one opportunity before the summer to put down a motion on hospital waiting lists next week instead. The motion of no confidence, which indicates the political will within the Dáil to pursue certain issues, would have placed pressure on Fianna Fáil to either support the government, or go against them, risking a collapse in the current set-up. Fianna Fáil’s pledge to support a Fine Gael minority government is due to end after the next Budget in October. Speaking on RTÉ Radio One’s Saturday with Cormac Ó hEadhra, Fianna Fáil’s Sean Fleming said that there had “been a lot of talk within the political bubble” but that his party had made it “very clear, we’re not distracted by that talk, and we’re totally focused on getting a good budget”. I am not interested in that political game, and neither are people at home – they want to know what is going to guarantee the level of housing that’s needed. 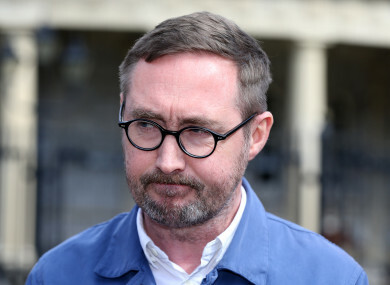 Fine Gael’s Colm Brophy said that the threat of a motion of no confidence was “to get Sinn Féin a bit of attention”, and force Fianna Fáil “to have a think about it”. Last week, Taoiseach Leo Varadkar said Fianna Fáil could face “a kicking” if they didn’t support Sinn Féin’s motion. The party’s housing spokesperson Eoin Ó Broin launched a mobile billboard earlier this week that featured Murphy’s image and blamed the ongoing housing crisis on “Murphy’s law”. “If you look at the billboard it was a list of things the minister hasn’t delivered on. It was the list of the increasing rates of child homelessness, pensioner homelessness, zero affordable homes, glacial delivery of social homes and increasing rents and house prices. There are some things Eoin Murphy has done and I’ve publicly supported him and welcomed him but if you look at the core issues of what there is to do to tackle the housing crisis , he’s not delivering. “The truth is the govt is failing: one in seven cant access healthcare, people still can’t get houses, still people are living in hotels despite promises they wouldn’t. You talk about stunts, but [what is] going up to a microphone and saying ‘I’m going to get a plan together’ to solve these? “Far from pulling stunts, Sinn Féin are constructive in opposition,” O’Reilly said. Email “Sinn Féin drops threat of 'no confidence' motion in Minister Eoghan Murphy”. Feedback on “Sinn Féin drops threat of 'no confidence' motion in Minister Eoghan Murphy”.